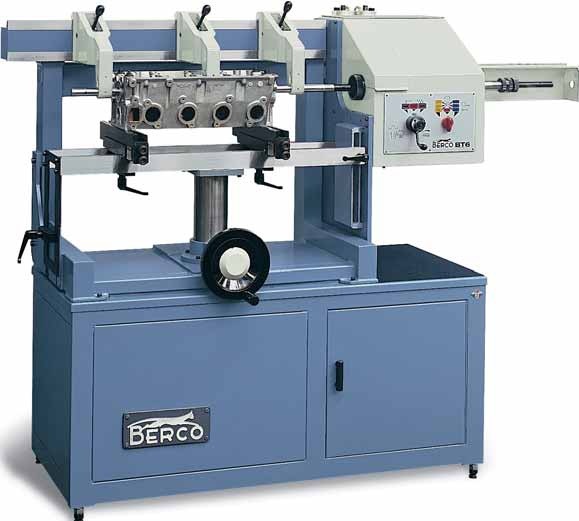 Although not large for a line boring machine, the Berco BT6 is extremely versatile for machining small camshaft housings and many larger main bearing housings with a boring capacity range from 23.5mm to 95mm. It has a fully adjustable bed height facility and can machine with the boring bar centre line as close as 103mm to the bed extending to a maximum of 378mm. It can accommodate a work piece of up to 810mm in length. The entire machine bed can be raised and lowered by means of a central column to set the approximate height for the job in question. The bed rests on which the work piece is mounted are fully adjustable both horizontally and vertically. Using the vernier micrometer screws ensures that the job can be mounted with extreme accuracy. The boring bar support rests ensure that the machine operates accurately along the length of the job. These rests are fully movable to enable full support as closely as possible to the housing being machined while maintaining alignment throughout the full length of the work. Spindle speeds are gear controlled for the ideal speed/feed rates to be set. When the boring operation is in progress the bar feed can be infinitely adjusted by means of an oil-pneumatic system allowing the perfect feed rate to be achieved for the job concerned. Boring tools are available in varying lengths and are mounted directly into the boring bar when machining smaller diameters. Alternatively, for larger diameters and operations requiring greater rigidity a special carrier mounted directly onto the boring bar is used. In either case the tool cutting diameter is set to achieve the correct finished bore size using a special setting tool incorporating a dial gauge and micrometer adjustment.